Free shipping on this product to a maximum value of $6.95 for a limited time only! 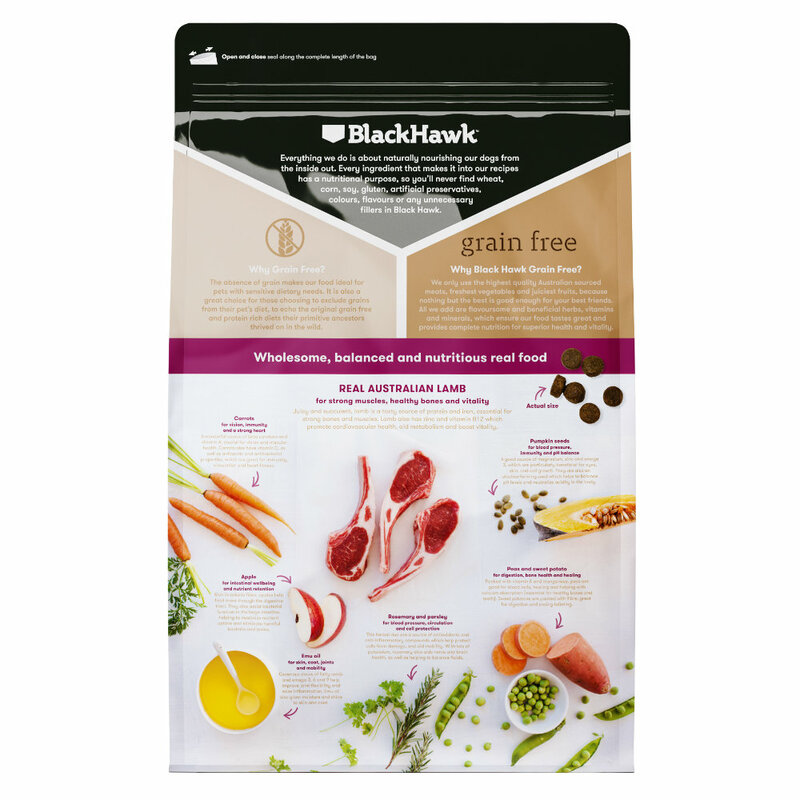 Black Hawk Grain Free range has been designed specifically for those dogs who can’t process grains well. This recipe contains real Australian lamb which is perfect for maintaining strong muscles and healthy bones as lamb is a great source of protein and iron. It also contains zinc and vitamin B12 which help in supporting healthy cardiovascular function and boosts vitality. This formula contains 0% grains and glutens - no wheat, corn, barley or rice. Check our Black Hawk dog food section if you are looking for other related products. Lamb meal, chicken meal, peas, tapioca, chicken fat (naturally preserved with rosemary extract, mixed tocopherols and citric acid), potato, sweet potato, chicken gravy, sugar bee pulp, essential vitamins and minerals (see tables), salmon oil, sunflower oil, chicory root, di-calcium phosphate, egg, alfalfa, salt, apple, brewers yeast, pumpkin seeds, natural antioxidants, coconut oil, yoghurt powder, emu oil, blueberries, cranberries, dandelion tea, parsley, peppermint tea, rosemary extract, chondroitin, glucosamine, carrots, yucca schidigera, spinach, kelp, tomato, beta carotene.